Canine hip dysplasia is a degenerative, painful condition where the hip joints have developed abnormally. The head of the thigh bone (femur) does not fit properly into the hip socket (acetabulum). These “ball and socket” joints become malformed and unstable, causing inflammation and weakness. Depending upon the severity of the problem, hip dysplasia can lead to painful and sometimes crippling arthritis. Older dogs with mild hip dysplasia may be treated successfully with pain relieving medication and a gentle, structured exercise programme and swimming. Younger dogs with hip dysplasia have a much greater risk of developing arthritis. It is difficult to restrict exercise for very young dogs and swimming can allow safe fun and socialisation without the risk of damage to the hips. Following a structured exercise program and lead walking only together with hydrotherapy can prevent the dysplasia worsening due to laxity in the supporting ligaments and muscles. Veterinary surgeons are using hydrotherapy to keep puppies fit and well-muscled while they wait for the dogs to reach 18 months to two years old. This supportive approach, together with the natural tightening process that maturity brings, can sometimes remove the need for surgery. 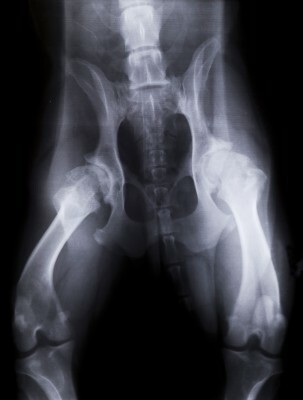 Severe hip dysplasia is sometimes treated surgically by either total hip replacement or femoral head excision. Either way, appropriate exercise is vitally important to maintain muscle mass to help improve the stability of the hip joint, maintain endurance and cardiovascular fitness and maintain the health of the articular cartilage surrounding the joint. It is also important to reduce the level of pain in the joints. Hydrotherapy is an excellent way to encourage joint mobility and stabilise the joint through building up muscle mass quickly and safely. Consistent, regular, gentle exercise such as swimming is the key to effective management of hip dysplasia in conjunction with regular medication and dietary supplements.